The Easter Train Set is cut out in our workshop. The first piece which is the engine of the train is hand painted yellow, brown, blue, pink, and orange. The rabbit is painted white. The second piece which is a passenger car is painted brown and green. 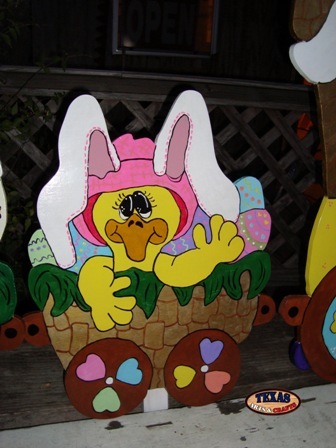 The Chick is painted yellow and the Easter eggs are multi-colored. The third piece which is a passenger car is painted brown and green. 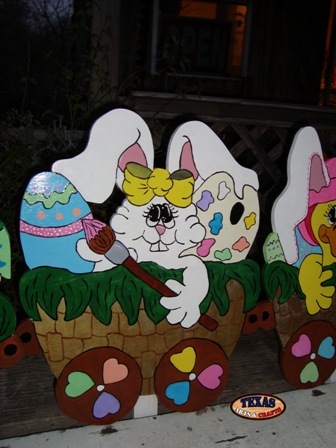 The rabbit is painted white and the Easter eggs are multi-colored. The fourth piece which is a passenger car is painted brown and green. 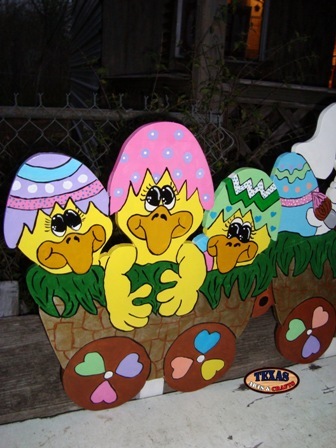 The chicks are painted yellow and the Easter eggs are multi-colored. The dimensions for the first piece are approximately 31.50 inches tall by 31.50 inches wide by .75 inches deep. The sign has a 28 inch peg. The first piece weighs approximately 7 pounds. The dimensions for the second piece are approximately 20.50 inches tall by 17.50 inches wide by .75 inches deep. The sign has a 24 inch peg. The second piece weighs approximately 2.75 pounds. The dimensions for the third piece are approximately 20.25 inches tall by 16.75 inches wide by .75 inches deep. The sign has a 24 inch peg. The third piece weighs approximately 2.75 pounds. The dimensions for the fourth piece are approximately 19 inches tall by 17 inches wide by .75 inches deep. The sign has a 24 inch peg. The fourth piece weighs approximately 2.75 pounds. The total dimensions for shipping purposes are 32 inches tall by 32 inches wide by 6 inches deep. The set weighs a total of 17.30 pounds with packaging. For the continental U.S. shipping and handling is included in the listed price. For shipping outside the continental U.S. please contact us through our Contact Us page. 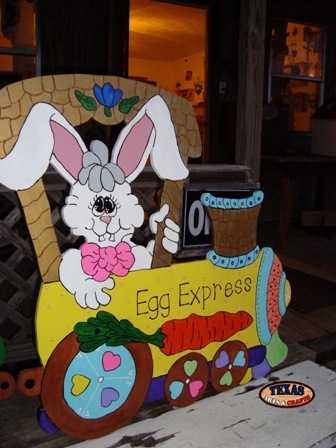 The Eggs For Sale sign is cut out in our workshop. 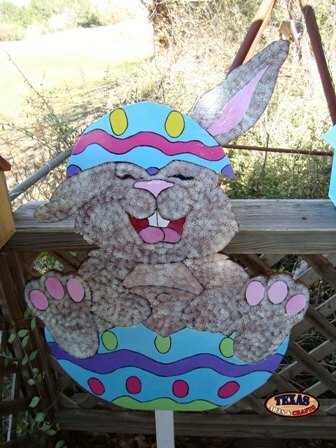 The rabbit is hand painted brown and the eggs are multi-colored. 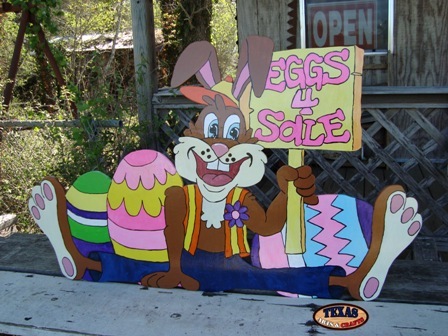 The rabbit is holding a yellow sign that read Eggs 4 Sale in pink lettering. The dimensions are approximately 29.25 inches tall by 47.50 inches wide by .75 inches deep. The sign has a 29 inch peg. The sign weighs approximately 9.75 pounds with packaging. For the continental U.S. shipping and handling is included in the listed price. For shipping outside the continental U.S. please contact us through our Contact Us page. The Easter Blue Rabbit sign is cut out in our workshop. 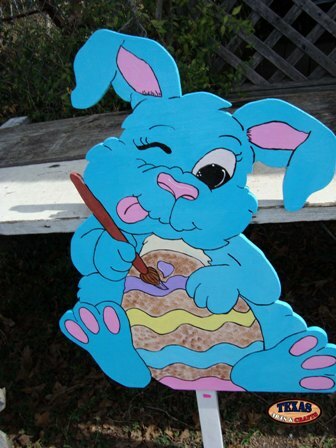 The bunny is hand painted blue. The rabbit is painting a multicolored easter egg. The dimensions are approximately 30 inches tall by 25 inches wide by 2 inches deep. The sign weighs approximately 6 pounds with packaging. For the continental U.S. shipping and handling is included in the listed price. For shipping outside the continental U.S. please contact us through our Contact Us page. 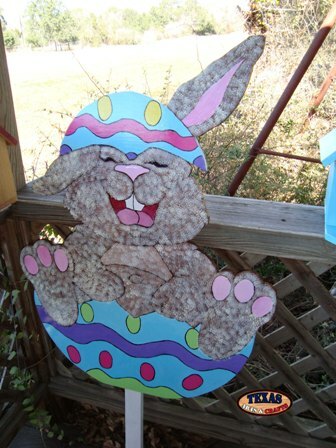 The Bunny In Blue Egg sign is cut out in our workshop. The rabbit is hand painted brown. The rabbit is sitting in a blue egg. The dimensions are approximately 34 inches tall by 26 inches wide by 2 inches deep. The sign weighs approximately 6.25 pounds with packaging. For the continental U.S. shipping and handling is included in the listed price. For shipping outside the continental U.S. please contact us through our Contact Us page. The White Rabbit sign is cut out in our workshop. The rabbit is hand painted white. 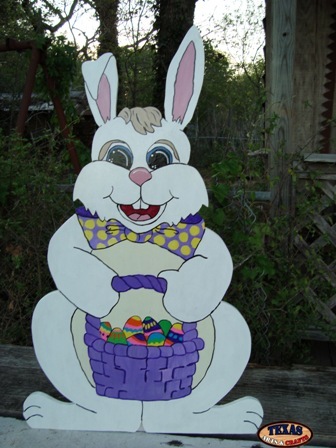 The rabbit is holding a purple Easter egg basket containing multicolored Easter eggs. The dimensions are approximately 33 inches tall by 20.50 inches wide by 1.50 inches deep. The yard sign has a 31 inch stake. The sign weighs approximately 5 pounds with packaging. For the continental U.S. shipping and handling is included in the listed price. For shipping outside the continental U.S. please contact us through our Contact Us page. The Rabbit In Car sign is cut out in our workshop. 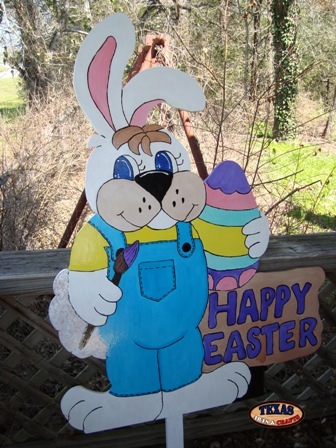 The rabbit is hand painted white in a blue, green, and yellow outfit. 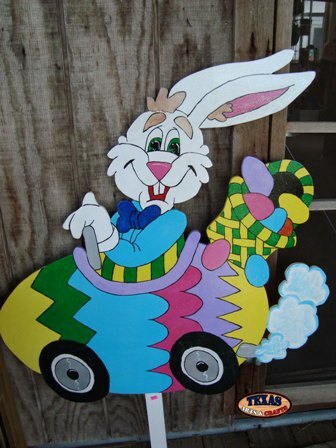 The rabbit is sitting in a multicolored egg car. The dimensions are approximately 34.50 inches tall by 34 inches wide by 2 inches deep. The sign weighs approximately 8.25 pounds with packaging. For the continental U.S. shipping and handling is included in the listed price. For shipping outside the continental U.S. please contact us through our Contact Us page. 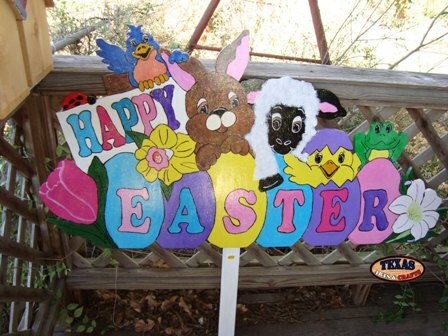 The Happy Easter Animals sign is cut out in our workshop. 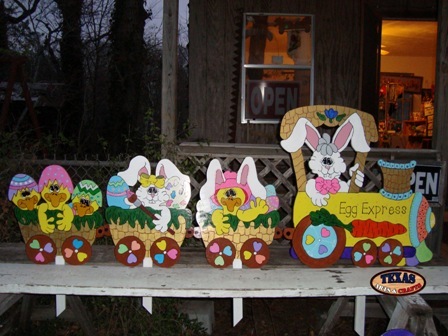 The animals and the eggs are all hand painted. The sign reads Happy Easter. The dimensions are approximately 23 inches tall by 46 inches wide by 2 inches deep. The sign weighs approximately 8 pounds with packaging. For the continental U.S. shipping and handling is included in the listed price. For shipping outside the continental U.S. please contact us through our Contact Us page. The Pink Rabbit and Chick sign is cut out in our workshop. 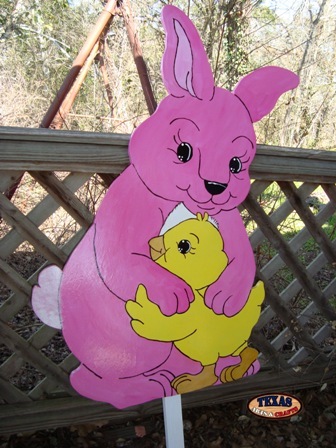 The rabbit is hand painted pink and chick is painted yellow. The dimensions are approximately 34 inches tall by 22 inches wide by 2 inches deep. The sign weighs approximately 9 pounds with packaging. For the continental U.S. shipping and handling is included in the listed price. For shipping outside the continental U.S. please contact us through our Contact Us page. The dimensions are approximately 46 inches tall by 34 inches wide by 2 inches deep. The sign is a local item only, and should be picked up from our shop or from a craft show.